A few weeks ago, Emma and I began a vacation of a lifetime together. 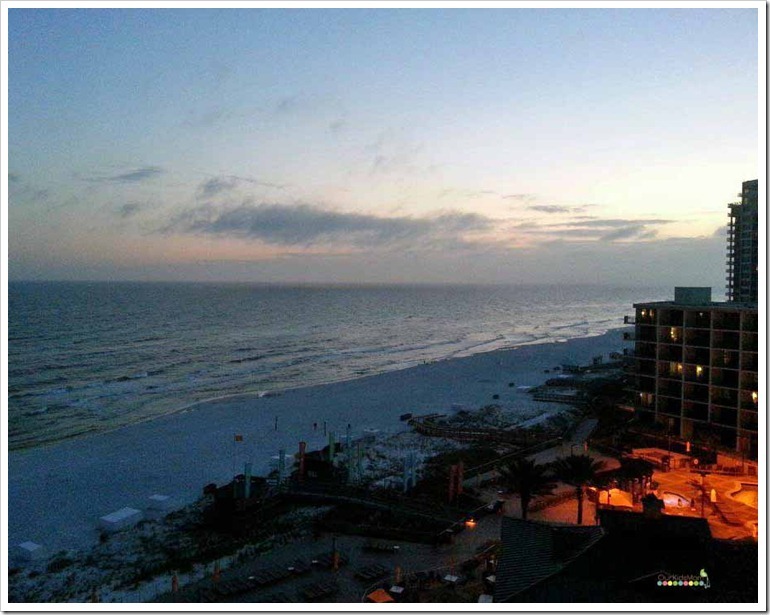 We were invited to be guests of the Hilton Sandestin Beach Golf Resort & Spa in Destin, Florida for three days and two nights. 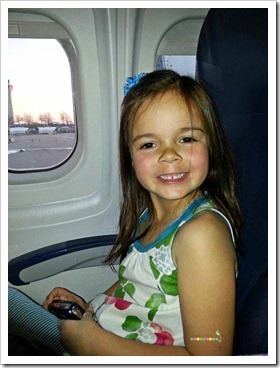 As a co-middle child I had recently been thinking that Emma had been a little neglected. I felt that this opportunity was perfect for us to have a little one on one time… something we hadn’t had in almost five years since her little brother came around. Even better news was that my sister, Amanda from Mommy of Two Little Monkeys, was also invited with her son! We had an early flight that morning, so early I had contemplated not going to bed at all. I’m actually surprised Emma slept. We made great time to the airport and then the waiting game began. You can see how sleepy we were in the photo… but nobody wanted to relax enough to close their eyes. 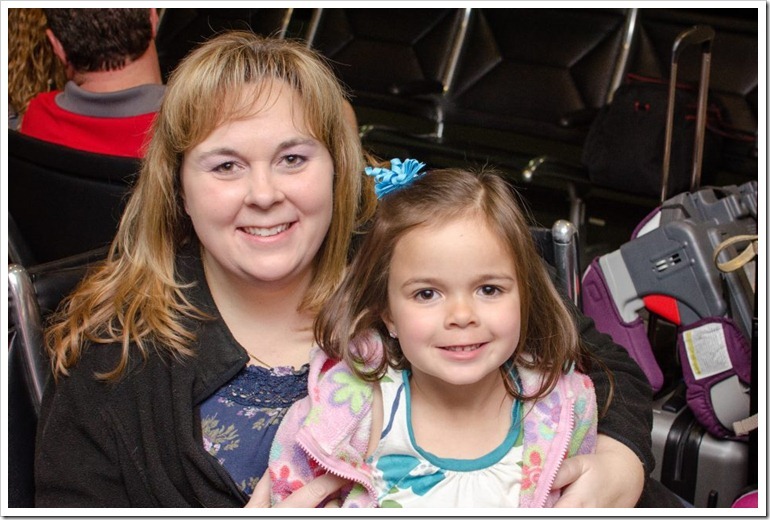 This was Emma’s first time on an airplane and I think the whole adrenaline of the experience kept her awake for most of the morning. We had a layover in Atlanta, but finally touched ground in Florida nearly 9 hours after we woke up. Almost everyone in the shuttle caught a few winks before we made it to the resort. We were greeted with wonderful Florida spring time weather in the 70’s. This was a fabulous break from the bi-polar weather we had been having in Missouri where one day it’s freezing and the next day you need shorts. Pulling into the drive of the resort I was impressed by the enormity of it all. 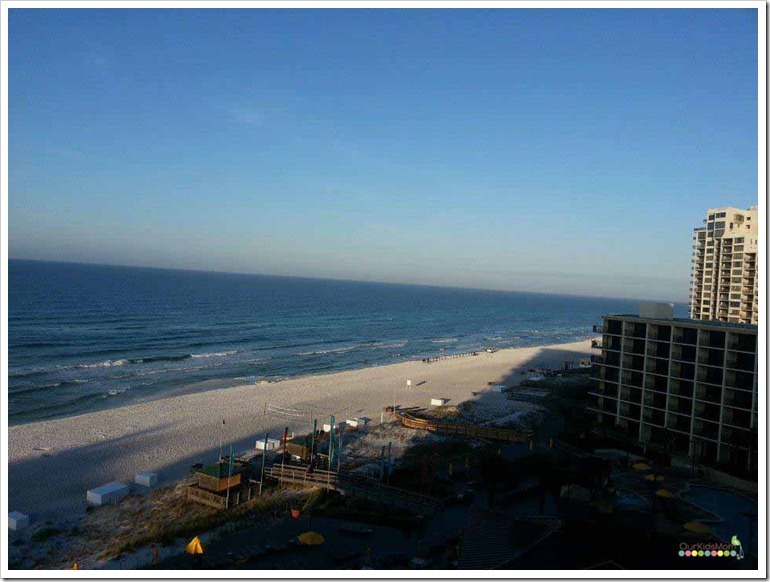 The Hilton Sandestin offers 598 deluxe guest rooms and suites located in the Emerald and Spa Towers. 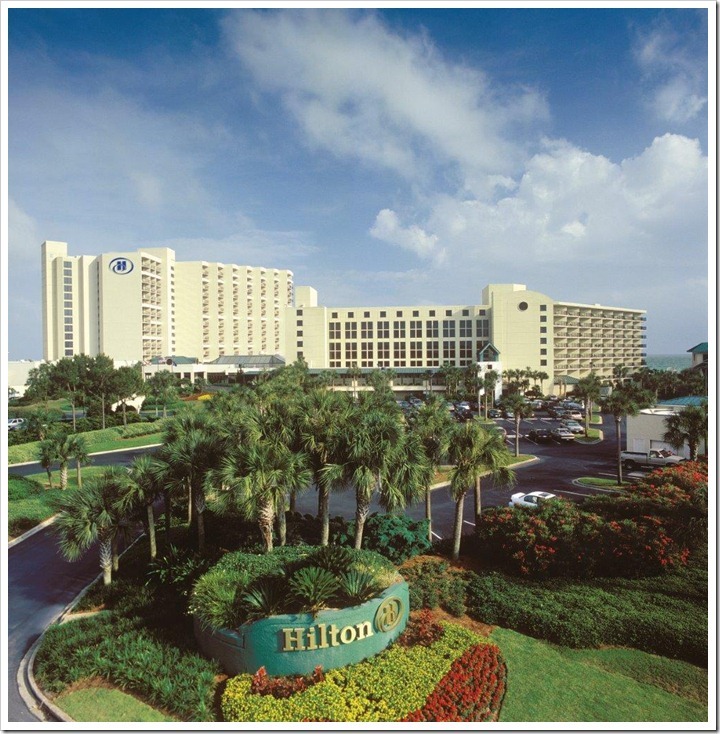 In 2012/2013 the Hilton Sandestin underwent a $5 million renovation which included updates to the resort’s 400-room Emerald Tower, featuring new carpet, vinyl in the guest hallways, and elevator cabs adorned with porcelain and stone cladding. I was tingling with anticipation to see what was waiting for us inside. 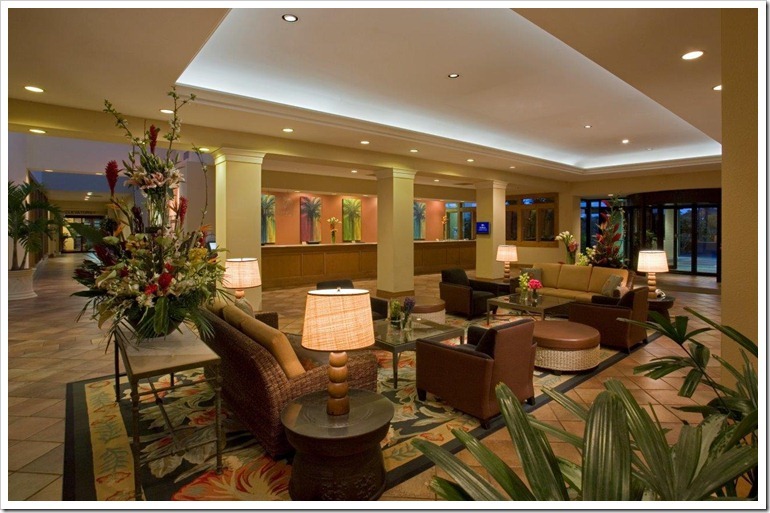 The lobby was a beautiful representation of what the entire resort has to offer. It is calm, serene and very welcoming. The employees at the desk were very friendly and helpful. Although we arrived before their 4:00 pm check-in time, one of our rooms was ready and they were able to get us checked in so that we could relax from a long exhausting day. I caught a glimpse of this welcome sign and had to smile. I truly felt welcomed and couldn’t wait to settle into our room. We were set up with a Junior deluxe suite with bunk beds, a media center, and a king sized bed (also available with two double beds) plus a queen sleeper sofa. Walking into our room you immediately saw the bunk beds. The child’s area also included a flat screen television with remote and a little bookshelf to hold their goodies. 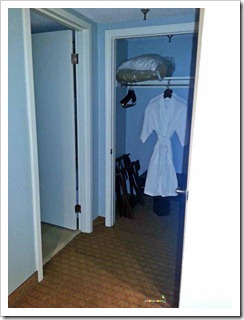 The bunk bed area is separated from the main area of the room by a long hallway with the bathroom in the middle. 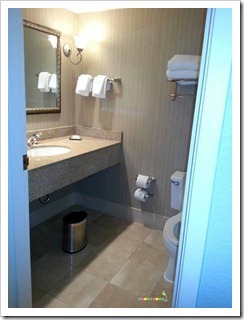 I love that there are two available sink areas, one out in the “open” and another in the bathroom itself. With a full room you are talking up to eight people getting ready. 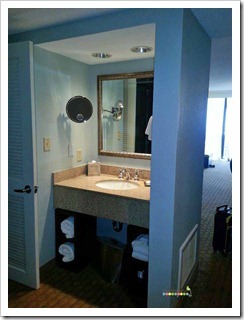 Two sink/mirror areas are a must. The main sleeping area of the room is spacious, welcoming and relaxing. All guest roomshave a balcony with partial- or full-gulf views and feature a refrigerator, microwave, coffee maker with daily complimentary coffee, hair dryer, lighted makeup mirror, premium cable TV, and wireless Internet. I was drawn to the sliding door… I just had to see what the view was from the balcony. I wasn’t fully prepared for what I was about to see, and I gasped. Pure beauty. The view from our balcony at the height of the day stunned me. I guess it didn’t fully dawn on me that I would only see water and sky as far as the eye could see. The beach speckled with umbrellas, the smell of the ocean, the pool bustling with swimmers and the enormity of the resort started to soak in and I couldn’t wait to spend some time outside. 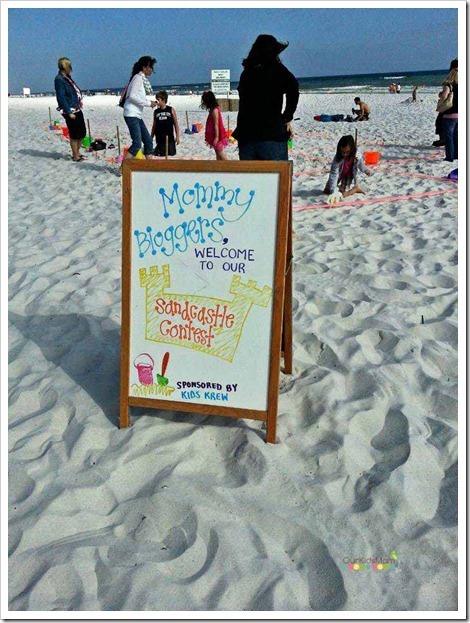 We got our first little taste of the beach during an event that evening sponsored by the Kids Krew (kids program). 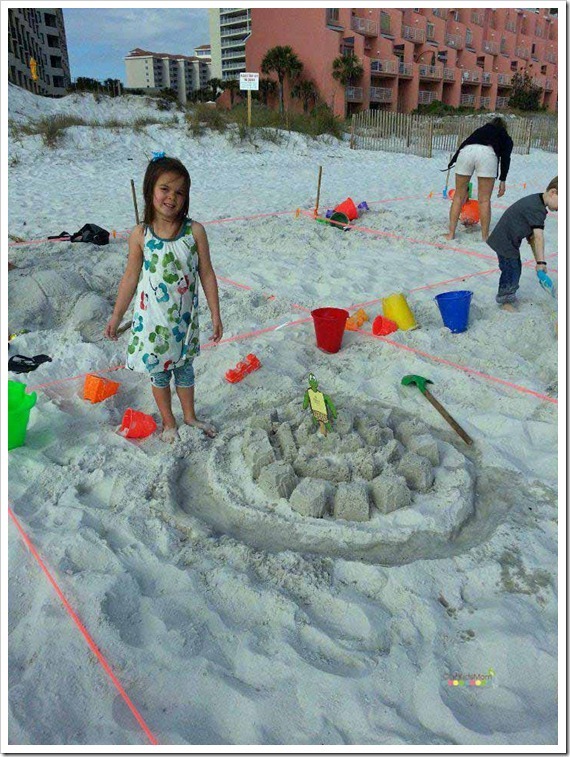 Emma and I were going toe to toe with the other bloggers and their children in a sandcastle building competition. Even though this was a competition, Emma and I created an unique bonding over our little castle. We were trying our best to make a quick over the top fortress with moat. In the middle of the process Emma stopped dead in her tracks, looked up with a huge smile and beaming eyes and told me, “Mommy, I am having so much fun with you!”. Talk about making your heart melt! As things died down a bit, Emma and I snuck off to the side of the group and began giggling about how soft the sand felt on our feet. 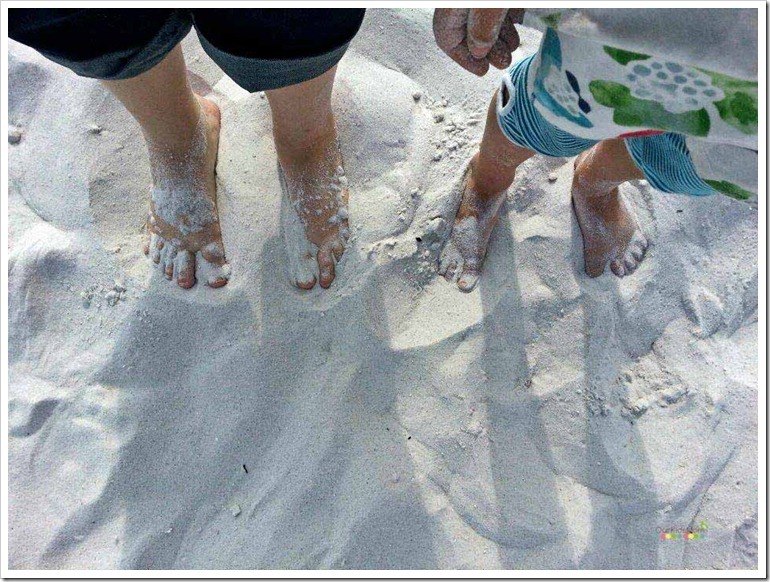 While squishing our toes through the sand I snapped a picture of our feet in the white Destin sand. It is really amazing how incredible the sand is on the beach. After a quick scavenger hunt to get to know the resort a little better we all met up for our first meal together (outside). As the Mommys chatted and got to know each other, the kids did what they could to get warm (the breeze off the ocean as the sun is setting made it a little cool for them). Here you can see Emma stretching her toes towards the fire in the fire pit. 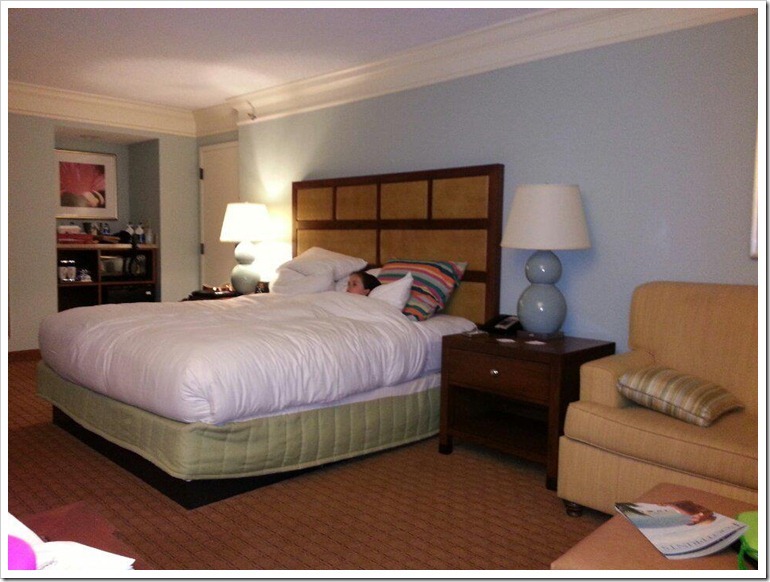 As everyone was exhausted, we all said our good-nights a little early and headed to the room for a long night of rest. 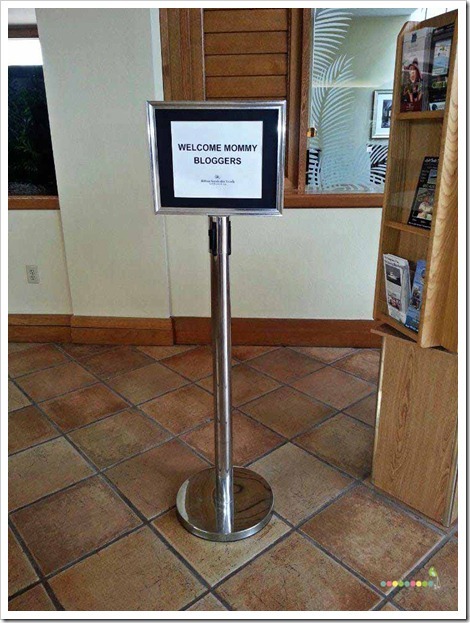 Once again the Hilton Sandestin went out of their way to make us feel welcome. Waiting for us when we came back was a glass of milk (in the fridge in the room) and cookies for a bedtime snack and a little relaxing goody for Mommy from the spa. All good intentions of sleeping in the bunk bed were put aside as Emma curled up in my bed waiting for me to finish getting ready for the night. I have to say, as hotel beds go… these were amazing. I am a spoiled Sleep Number owner, so for me to say I woke up refreshed without a back ache is incredible. As I was about to get into bed I snuck a peek out of the sliding glass door to find this incredible view from our balcony. The sunset was calm, serene and relaxing. I could have spent hours sitting on the balcony listening to the waves, but instead left the glass door open so we could drift off to sleep to the sound of the ocean. Morning came a little too soon, but the view from our balcony at sunrise with a fresh day beginning, the sun warming the sand and if you look in the distance you can see the umbrellas being set up for visitors made me eager for our time in the sand that afternoon. I have so much more to share with you like the resort’s amenities, dining, Serenity by the Sea Spa, and Emma’s experience with Kids Krew. 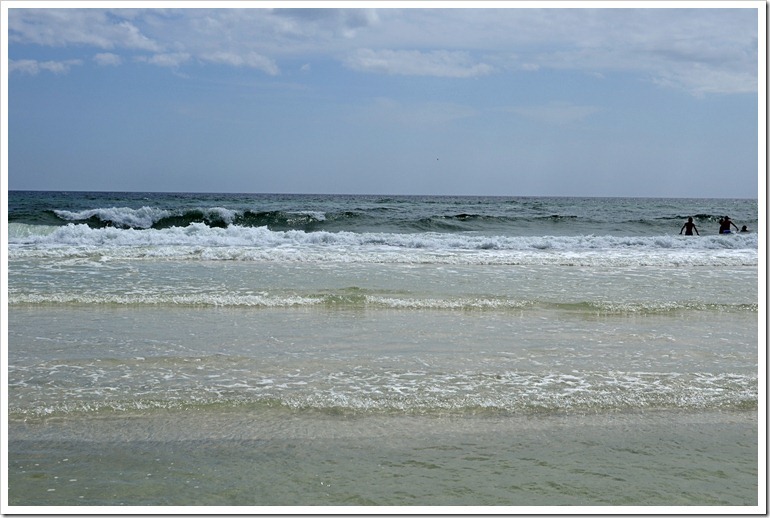 But for now, I leave you with the Gulf of Mexico’s sugar-white sands and emerald-green waters. 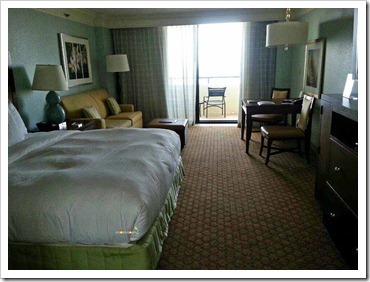 Disclaimer: I visited the Hilton Sandestin Beach and Golf Resort as a guest of the property. All opinions are 100% my own. I LOVE the bunk bed option! That is the coolest thing! I know, right? 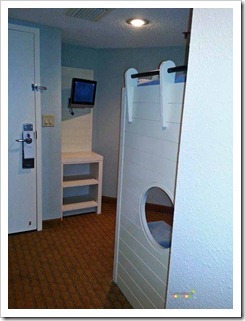 I think more resorts, heck even hotels, should offer “family” rooms with bunk beds! What a beautiful resort! I love that the suites have bunk beds! It looks like you girls had a beautiful stay!!! Oh Bekah, we did! I can’t wait to share the rest of our stay! how beautiful! im totally jealous seeing that beach! ive always wanted to go to Florida. if i ever do, at least I know where to stay now! It’s so worth the extra money. 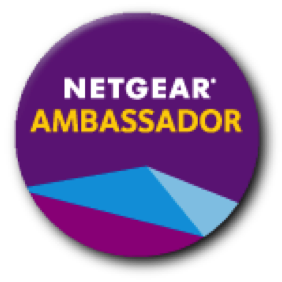 Watch their site for specials to save a little. Early April wasn’t so bad there, either, and I bet it’d be a little cheaper in Spring. I thought the water would be freezing but once you stood in it for a few minutes it wasn’t so bad! They did a great job with the renovations, that’s for sure! I dream about that view and the sound of the ocean as we drift off to sleep. Hopefully I can bring the whole family some day. I am so jealous! I need a getaway like that with my daughter, though she is almost 21 😉 Can’t wait to hear more about your trip. The hotel is beautiful! I went to New York last year with MY 20 year old daughter. 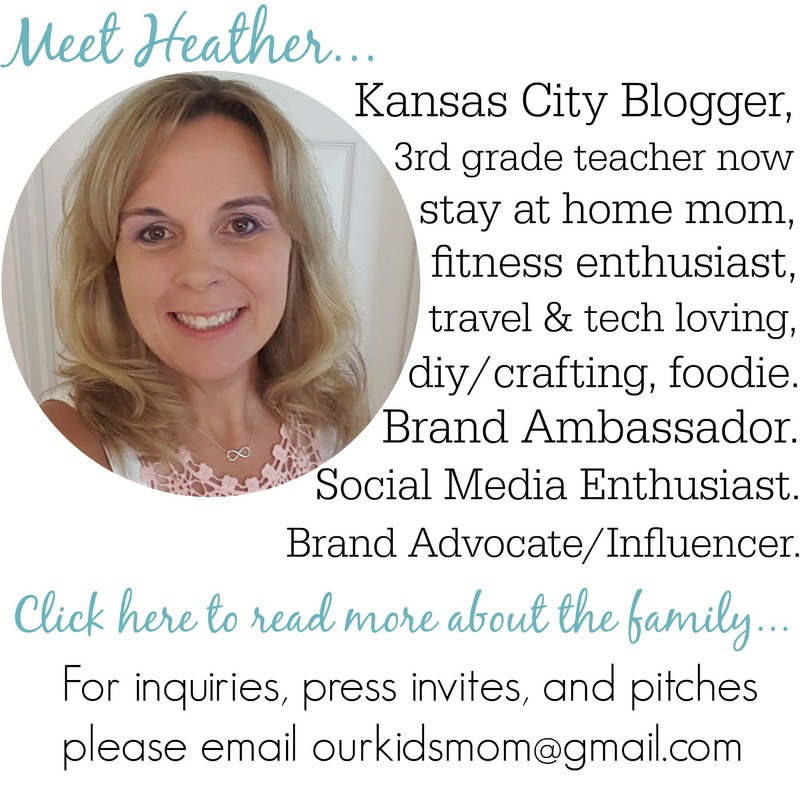 It was for a blogging conference, but we still had a blast! It’s so worth having a few days alone in a special place. so jealous! what a gorgeous view you had! It was beautiful, Courtney. I can’t wait to share more with you! That looks like a ton of fun! 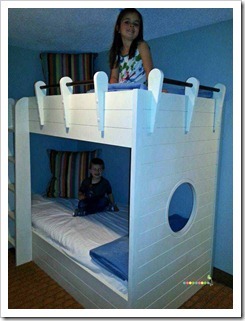 The bunk bed is so cool, this would be great to stay at with our kids! It looks like you had a wonderful time. 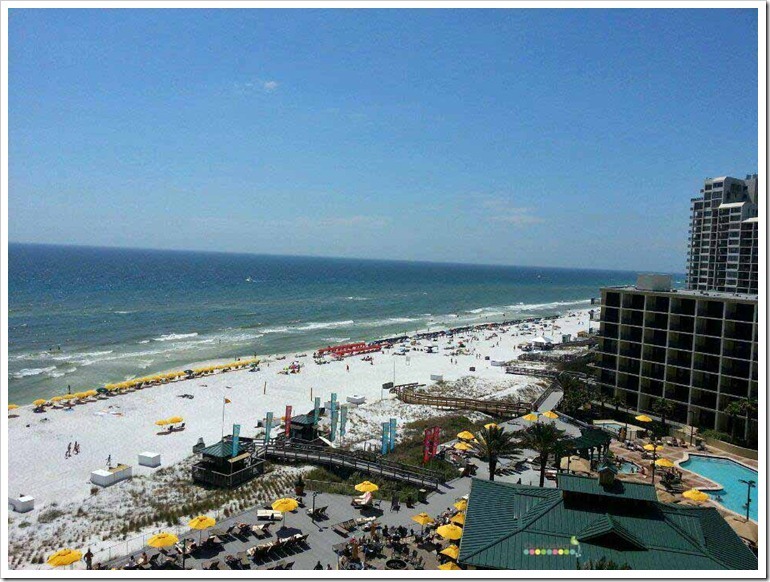 If you ever feel like heading this way again, please check into condos and hotels on Okaloosa Island (Fort Walton Beach). Although I have to admit that the Sandestin resort is beyond beautiful, I am sure that the prices are much better where I live. We have the same wonderful beach and much less crowded. I just returns from my first trip to Florida. I enjoyed it so much I am ready to return. I look forward to follow your posts about your trip. 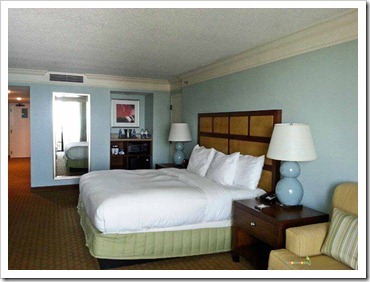 The bed looks so inviting with a nice room. What a gorgeous place to get to travel to! The beach is really incredible. 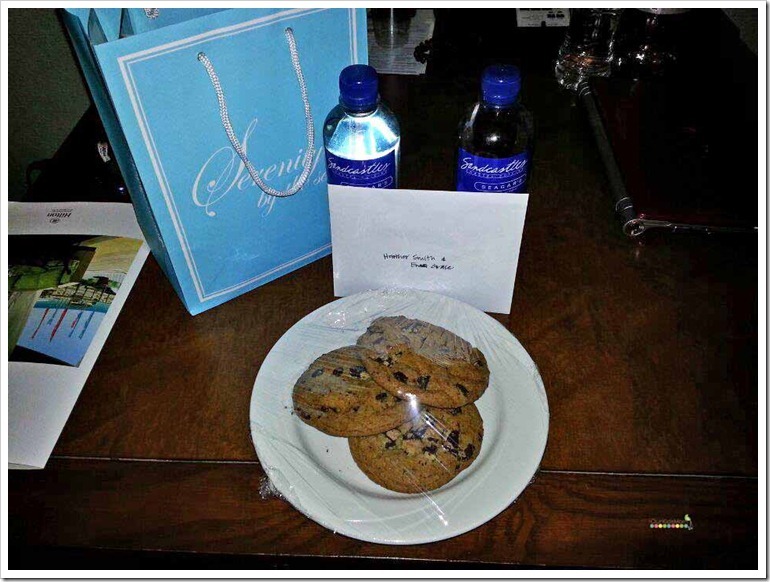 I liked the room and the cookies were a great touch. I think the place is amazing! I have to tell you that reading your post makes me want to head to the beach and dig my toes in the sand. 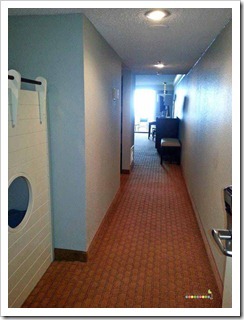 What a wonderful getaway for you and your little one. I’m sure she was ecstatic over her time away with mommy. I spent a week in Destin umpteen years ago and it was magical then. I think that it has some of the most beautiful beaches/sand in all of northern Florida! They also had some great deep sea fishing. The hotel looked fantastic, but I think the best part was the time you and Emma got to spend together. 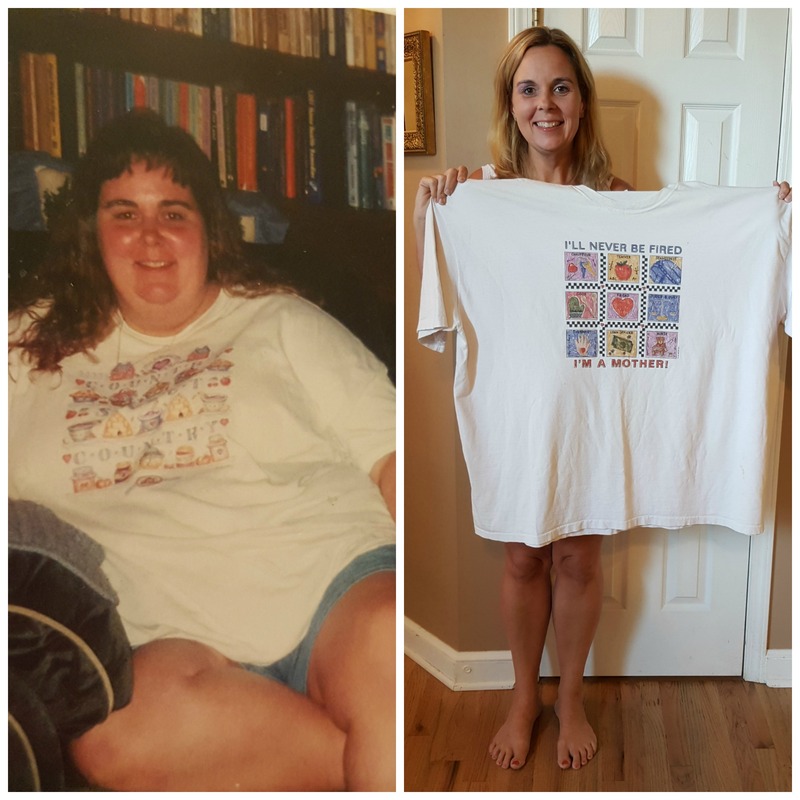 It’s something that will hold very special memories for her (and you) forever! 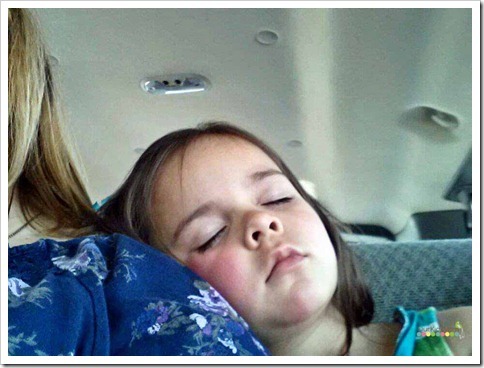 This is truly a special vacation and how great you could do this with your sister, too! I love this place! and the view of the beach is so inviting. I want to feel that warm, white sand and enjoy those cookies! They really rolled out the red carpet for you, how sweet! Yet it is a nice place even if they didn’t do all that just for you! So nice! When I intend to go to Florida, I’m checking this out! that place looks incredible! I would love to stay that close to the ocean. and that childrens bed!! wow.